SW asked me to augment a Perl script that originally processes ISO-8859-2 encoded text (TeX) files only by adding UTF-8 and CP1250 (one byte MS Windows encoding for Central Europe) encodings as well. I reencoded the script from original ISO-8859-2 to UTF-8 as well with iconv, so all strings are UTF-8 encoded now. While GDP per capita is mainly an indicator reflecting the level of economic activity, Actual Individual Consumption (AIC) per capita is an alternative indicator better adapted to describe the material welfare situation of households. * 2011 population figures adjusted on the basis of the 2011 Census. Therefore the per capita indices for 2011 are not entirely comparable with previous years due to this break in time series. 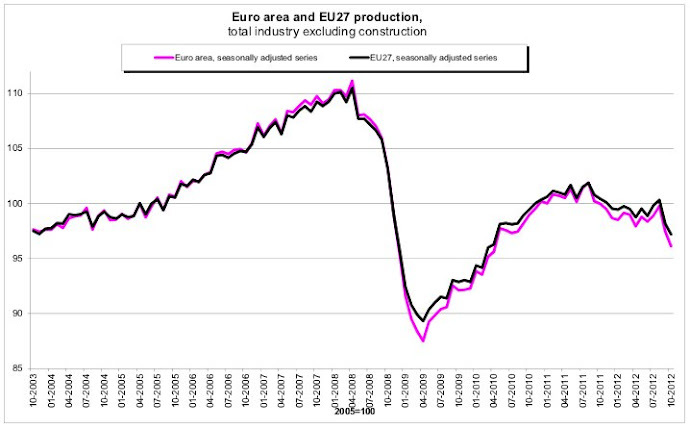 The euro area (EA17) consists of Belgium, Germany, Estonia, Ireland, Greece, Spain, France, Italy, Cyprus, Luxembourg, Malta, the Netherlands, Austria, Portugal, Slovenia, Slovakia and Finland. 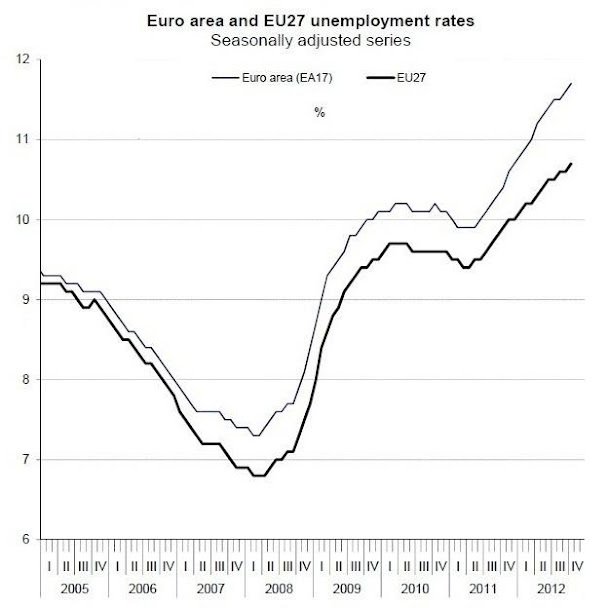 The collapse of production during April-2008--April-2009 period (left figure) corresponds to a significant rise in unemployment (right figure), however in April 2009, when production was at the lowest level, unemployment rate was approx 9% while currently is is approx 12%. 0,25W 10K OHM carbon resistor (very cheap). female connectors (pol. kable połączeniowe żeńskie), telephone cables or similar four core cable (pol. kabel czterożyłowy), terminal block (pol. kostka połączeniowa) and heat shrink tubing (pol. rurka termokurczliwa) to insulate and strengthen connections. The recommended way is to use a breadboard (pol. płytka stykowa/prototypowa) as described in learn.adafruit.com. My interest in electronics is limited, I've never used breadboards etc... I had some spare cables and terminal blocks so I designed it that way (cf. pictures). NOTE: The cheaper version of the DHT-22 is a DHT-11 (aka SHT-11). Tempted by the lower price I bought two DHT-11 sensors but I do not recommend it. First of all, the temperature is measured in the range of 0 °C to 50 °C (with poor accuracy of +/- 2 °C) so is not suitable for outdoor (at least in Europe). Second, the humidity seems to be understated. Third, it does not work when DQ line is connected to other GPIO pins than pin #24 (maybe it's a software problem). For comparison, DHT-22 measures the temperature in the range of-40C to +80 C with an accuracy of +/- 0.5 °C. I follow the tutorial available at learn.adafruit.com but some details were modified. There are four pins in DHT-22 (see Figure # 1). 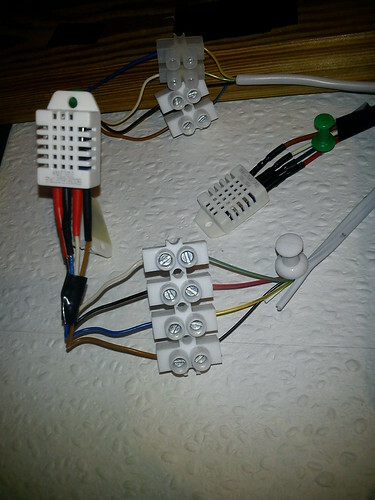 I connected data line (DQ) of each sensor to pins P22, P24 and P25 respectively (each sensor must have a separate data line). Vdd pin of each sensor to P1 (3.3 V supply). 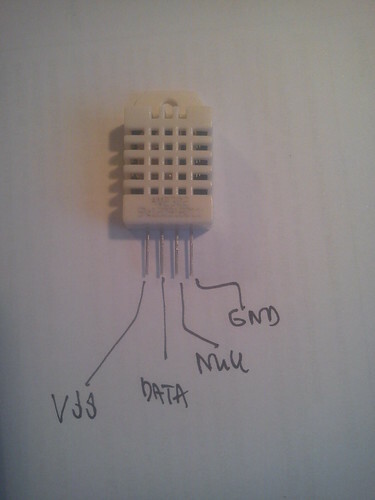 GND (ground) pin of each sensor to P6. In addition, each DQ was connected via the resistor with the power line Vdd. Pin Null is not used. 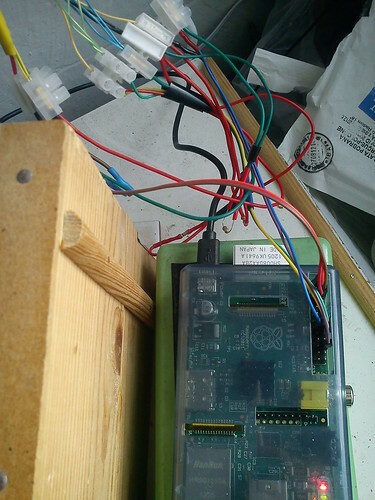 The sensors were connected to GPIO pins via terminal blocks, cables and some soldering. As in the case of 1-Wire bus there are problems with the reading of the sensor. That's why the function ReadSensor is trying to read the sensor several times. Maximum number of failed attempts, we have observed during several days of operation is 3. Note: I noticed that higher system load (including intensive I/O operations) cause problems to retrieve data from the sensors. I tried to run motion detection application (motion) configured to use as little system resources as possible with no success. Rapberry overclocked to 900 Mhz performs significantly better but still only about 20% tries returns some data. Exact nature of the problem is a mystery to me as for example top indicates that still more there 80% of CPU is free. Other question to consider is: whether the readings are correct during high humidity? My outdoor sensors tend to indicate 99% humidity pretty frequently which seems suspicious. I have compared data obtained from 3 different sensors (namely WH 2080 clone, Oregon Scientific's RMS300 and DHT-22) and some differ significantly. Script outcome is available here. All scripts and other stuff discussed in this blog post are available here.